How Do I Find An Eco-Friendly Fabric? When shopping for new furniture or looking for a fabric to recover a cherished old sofa, the term “eco-friendly fabrics” is likely to be seen everywhere. This is a direct result of consumers becoming more aware of the harmful effects highly-fluorinated chemicals have on our health and environment. Environmental groups, universities, and government agencies are releasing information to the public about the large amounts of earth’s resources we are using to make natural fibers into upholstery fabrics that will end up in our homes. Consumers demand fabrics that are safe for their families to live on and safe for the environment, thus what should consumers look for and what should consumers stay away from when searching for an eco-friendly fabric? What should I look for when searching an eco-friendly fabric? 1. 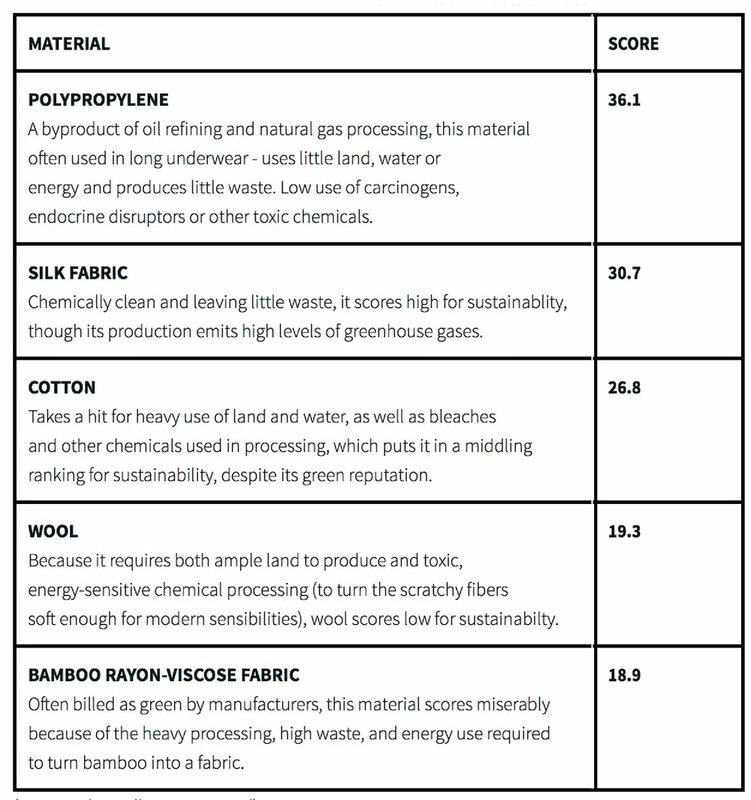 Did you know many eco-friendly fabrics such as linen, wool, cotton, and polypropylene are listed and ranked under the Higg Index? The Higg Index was started by the Sustainable Apparel Coalition and allows brands, factories, and chemical manufacturers to score the sustainability of their products. So, if you want to know if cotton is more or less environmentally friendly than wool, the Higg Index is a great resource. Below, you can see the Higg Index and how it reports the environmental impact of materials used in home furnishings, apparel and footwear. The more sustainable the material, the higher the score. 2. If your fabric sample is stamped as Greenguard certified then that fabric has passed the world’s most extensive standard for low emissions of volatile organic compounds, which are known as VOC’s into indoor air. This means the fabrics are acceptable to be used in environments such as schools and healthcare buildings. 3. A fabric is eco-friendly if it has passed the Global Organic Textile Standard (GOTS). The GOTS strives to produce only organic textiles from the harvesting of the raw materials and to use only socially and environmentally responsible manufacturing practices. To become GOTS certified, a textile product must have a minimum of 70% organic fibers. What should I stay away from when searching an eco-friendly fabric? 1. Highly-Fluorinated Chemicals, often known as PFCs, have stain and water-repellent properties. These chemicals are used in industrial applications and in consumer products because they achieve cleanability. You will see PFCs in furniture, carpets, clothing, and cosmetics. PFCs are harmful for the environment because they do not breakdown. Worldwide, PFCs are discovered in many environments, even in whales! As you and your family sit on your sofa, you are exposed to these chemicals that can cause major health concerns. A few possible harmful side effects are high levels of cholesterol, thyroid problems and testicular cancer. 2. Antimicrobials can be found in furniture textiles and can possibly cause developmental, hormonal, and reproductive problems. These chemicals are added to products to destroy or inhibit the growth of microbes. In the home, products containing antimicrobials are typically washed down the drain, then flow into the water stream. Antimicrobials make their way into aquatic environments, which can be toxic to aquatic organisms. 3. Flame retardants are added to fabrics in order to meet flammability standards, yet these chemicals can be harmful to our health and environment. These chemicals are meant to prevent fires, but some can cause lowered IQ and hyperactivity in children. Flame retardants can upset hormone disruption in adults. The environment is can be damaged when flame retardants are released from products and seep into the soil, rivers, and oceans. These chemicals are seen as pollutants as they can build up in the marine food chain and become a harmful health concern for the marine life. 4. Volatile Organic Compounds (VOCs) are chemicals that come from liquids and solids, which vaporize at room temperature and then enter the atmosphere. This process is commonly known as off-gassing. VOCs can cause indoor air quality issues such as eye, nose, and throat irritation. To name a few, VOCs are found in fabric, upholstery, carpets, and furniture.